Arthur William Buck was born in Bromley-by-Bow, London on 30 November 1914, the younger of the two children of George and Ann Buck. At the time of his birth, his father was employed as a carman. He later became a bus driver. Buck worked as a commercial traveller before the war. He joined the RAF in 1940 but did not begin air gunnery training until 1942. 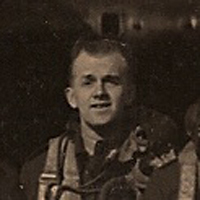 In January 1943 he was posted to 1654 Conversion Unit, where the whole crew which would eventually fly on the Dams Raid with Cyril Anderson came together. Arthur Buck married his wife Minnie Rosetta England in Beckenham in 1941. Along with his comrades, after the war he was reburied in Rheinberg War Cemetery. Wow!!! Has off to you Charles – the comprehensiveness of the final collection as you’ve designed it and presented it is superb! What a Legacy!